Princess Mary Tudor was the apple of her father’s eye for many years prior Anne Boleyn returning to England. Freshly back from her duties in France, Anne was unlike most women and Henry VIII noticed. We don’t know the exact date that Henry noticed Anne but once he did it changed the course of English history. After Katherine of Aragon’s last unsuccessful pregnancy Henry began to consider that he would never have a male heir. He believed the fact that he had married his brother’s widow was the reason why. That God would not grant them living male sons because of their sin. Henry referenced Leviticus 20: 21 which said: “If a man should take his brother’s wife it is an unclean thing…he shall be without children.” Henry took this as living sons, specifically. This was completely against everything that happened at the beginning of their marriage – Henry made sure to get a papal dispensation so he could wed his brother’s widow. Now it was convenient for the king to turn things around to his advantage. It was around 1524, when Henry began to aggressively pursue Anne Boleyn, historian Eric Ives believed that this is when Henry began to reject Katherine of Aragon and stopped sleeping with her…it had been seven years since her last pregnancy. When exactly he began to turn away from Katherine is unclear. It may have been in 1522 but most definitely by 1525 when he brought his illegitimate son, Henry Fitzroy, out of the shadows and created him Duke of Richmond. This gave him precedence over everyone except for a legitimate son he may have in the future. Henry didn’t immediately turn against his daughter Mary, it took time for that to come to fruition. But once he did, poor Mary must have been so confused. As a young woman it must have been heartbreaking to lose the love of your father, and king. No wonder why she disliked Anne so much. Who could blame her – she saw Anne as the woman who took away her father and destroyed her family. While that may be what Mary believed, it’s definitely not the truth – Henry is responsible for this as Anne tried several times to have a relationship with Mary. Mary always refused because she was loyal to her mother. On the 7th of September 1533, Queen Anne Boleyn gave birth to Princess Elizabeth. She and the King were disappointed that their first child was a daughter but were optimistic their next would be a son. Unfortunately, this is when things began to change for Mary. Soon after, Mary would lose her title of Princess and only be referred to as Lady Mary Tudor. Could you imagine? For seventeen years you are a princess and suddenly you no longer have the prestigious title that goes along with being the legitimate daughter of a king. Her mother had already fallen from grace as the King had ended their marriage, and now Mary was removed from the line of succession and declared illegitimate. One can only imagine the malice Mary held toward Anne because of this. She definitely saw this woman as the one responsible for her misery. Not only had she lost her title but she also had to serve in the household of Princess Elizabeth. You would think Mary definitely had animosity toward the situation she was in. She was defiant when first placed in Elizabeth’s household at Hatfield – she spent days in her chamber, uncontrollably crying and refusing to acknowledge Elizabeth as Princess. She would, however, call Elizabeth “sister” just as she called Henry Fitzroy, “brother”. I’m not aware of how Mary felt toward Henry Fitzroy but I assume it was similar to her feelings for Elizabeth. However, Fitzroy’s mother had not destroyed everything she ever knew. So it’s possible she liked him as well. It is clear that Anne did not feel threatened by Fitzroy; She was instrumental in securing the marriage between her cousin Mary Howard and him. This is something that I do not understand. You would think the last thing she wanted was to have him declared legitimate and thus remove her daughter from the line of succession, but it did not seem to be a concern of hers. Anne’s marriage being declared null and void after she was charged with adultery made their daughter illegitimate along with her sister, Mary – Henry Fitzroy was now presumably the only heir presumptive. Of course, Henry expected to have a son by Jane Seymour but Fitzroy was his steady backup, even though he himself was still considered illegitimate. According to author Antonia Frasier, after Anne Boleyn’s arrest Henry VIII went to see his son, Henry Fitzroy. In tears he told Fitzroy that Anne was a ‘poisoning whore’ who had planned to kill both him and his half-sister Mary; what a lucky escape they had had! In David Starkey’s book titled, “Elizabeth” he says that after the execution of Anne Boleyn that Mary made her peace with Boleyn’s ghost and prayed that ‘that woman’ might be forgiven. 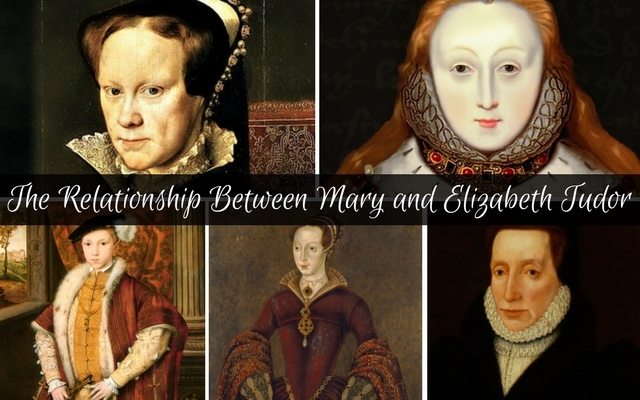 He also mentioned that Mary and Elizabeth got along well and lived amiably under the same roof. The sisters became really close. Two months after Anne’s execution Henry Fitzroy died. This left poor old Henry VIII without Fitzroy as his backup and Jane Seymour was not yet pregnant. But, in October 1537, Jane Seymour gave birth to a son – Henry was over the moon and great celebrations were had everywhere. From all accounts, both Mary and Elizabeth loved their brother Edward – there is nothing recorded that would tell us they harbored any resentment toward their brother, the prince. The siblings all loved one another – they didn’t care that they had different mothers, they were all children of the king. When Edward ascended to the throne in 1547, he would continue with the Reformation process and push it even further than his father had. This was something that truly upset Mary as she was a staunch Catholic. Several times Edward attempted to press Mary to convert and was unsuccessful. He even jokingly suggested that Thomas Seymour wed his sister so he could change her ways. That, of course, never happened as Seymour only wanted Elizabeth or Katherine Parr. This was a turning point for Mary, she realized that there were people who did not want her on the throne. She also knew that her sister Elizabeth was raised in the Protestant faith and there was concern about others wishing Elizabeth to take her place. Mere months after Mary became queen, Elizabeth felt it necessary to reach out to her sister for a meeting. She understood that her sister was aware of her religion and so pleaded ignorance of, not hostility toward, the Catholic faith. All she knew was how she was raised…as a Protestant. Not long after Mary’s coronation she had Parliament declare the marriage of Henry VIII and Katherine of Aragon valid – this appears to have brought up old hostilities toward Elizabeth. She even toyed with the idea of removing Elizabeth from the line of succession but found that would not be as easy as she thought, regardless she would not need to worry about that since she’d hope to have a child of her own making it all unnecessary. Mary’s Council continued to push her to rid herself of Lady Jane Grey, who was sitting in the Tower of London, as they saw her as a threat to her throne. Mary was soft about her dear cousin and kept her locked away instead of executing her. She understood that Jane wanted no part in becoming queen and felt sorry for her. It wasn’t until Wyatt’s Rebellion that her hand was forced and the execution of Jane was ordered. Wyatt’s Rebellion only cemented Mary’s paranoia against her sister and Jane’s fate. It appears that Mary was concerned about what Elizabeth was doing and who was in her inner circle. Elizabeth, not wanting to be on her sister’s bad sad, made sure by all outward appearances to act the loyal subject by practicing the Catholic faith in public and not associating herself with rebels, hoping her sister would not find reason to arrest her. With all the turmoil in the country surrounding religion, many wished Mary to be removed from her throne and Elizabeth to take over as Queen of England. Elizabeth was smart enough to know it was suicide to go along with any plans and seemed comfortable waiting for her turn. She may not have agreed with her sister’s dealings as queen but she knew it was suicide to go against Mary. The queen was paranoid nonetheless and called for her sister to come to London. Allison Weir states in her book, “The Children of Henry VIII” that Elizabeth feigned sickness to save herself. Ambassador Renard suspected that Elizabeth was pregnant with Edward Courtenay’s baby, so Mary’s physicians examined Elizabeth to ensure she was safe for travel and concluded that she was only suffering from ‘watery humours’ or nephritis and was able to travel to court. Renard continued to push for Elizabeth and Edward Courtenay’s execution, going so far to say, When these traitors have been removed “Your Majesty need have no fear for your crown.” Renard is an example of the type of people who were trying to keep the sisters apart. Unfortunately, Elizabeth was probably the one person who understood Mary best. We will never know for certain whether or not Elizabeth’s ‘illnesses’ were real or not but we can conclude that she was smart enough to know how to manipulate situations to her advantage. Mary’s concerns were real. As the first Queen regnant of England she was paving a path that was never laid out before. There were enemies around every corner and she had to figure out on her own who was friend and who was foe. It appears that many were convincing her that her sister was foe – so many that there were rumors that Mary would name her Catholic cousin, Margaret Douglas, Countess of Lennox her heir. Margaret was the daughter of Henry VIII’s sister Margaret Tudor, who had been queen consort of King James IV of Scotland. With this in mind, Margaret Douglas seized the opportunity to besmirch Elizabeth’s reputation by relaying gossip about her to Mary so she would look more favorably on her. When the queen wed Philip of Spain her subjects and the Council were not pleased with her. She had truly believed that it was God who wished her to marry Philip to help in restore England to Catholicism and Rome. Of course, it had been many years since her father had become the Head of the Church of England so many of her subjects were raised Protestant and happy to continue as such. There were others who were just as happy to return to Catholicism. It was a difficult time to live in England. Even though Mary locked away her sister in the Tower of London to control the situation, she always had a connection with her sister. She had helped raise Elizabeth years ago and understood her personality better than anyone else. When Elizabeth was first placed in the Tower she requested, no begged, to write to her sister and plea her case. She was so concerned that other’s would try to change her message that she scored the blank space at the bottom of the letter to ensure nothing could be added. In her dying days, Queen Mary understood that if God would give her ‘no fruit nor heir of my body’ that England would then go to the person ‘the laws of this realm’ decreed. Mary could not get herself to name Elizabeth as her heir but knew her statement made it so. She made Elizabeth promise that she would not immediately change the country’s religion, and to pay the queen’s debts. In the end, I truly believe that Mary loved Elizabeth – she was her kin and both were children of a king and his queen consorts. She never executed her sister, only threatened her harm to get her way. *If you are interested in hearing the recorded version of this article in my podcast, click HERE. Anne Boleyn was very smart to arrange the marriage between Fitzroy and Mary Howard. It was not in her best interests for Fitzroy to marry a princess or noblewoman from the continent. Any children Fitzroy had due to such a marriage would be a threat to her daughter Elizabeth’s position in the succession. Keeping the marriage in the family allowed the Howards to retain control over the situation. Just a note: Mary Howard’s mother was dead set against the marriage with Fitzroy. She lost her position at court because of it. Just did a second DNA ancestry test. I got Habsburg family dna connection through a maternal ancestors. Shock! All I know is that a distant ancestor was a Spanish hapsburg. I don’t think they loved each other at all.